Hello. :-) In the years before I had children, I used to force paperwhite flowers to give as Christmas gifts. It's really easy to do, and makes an incredibly lovely presentation for someone (even yourself). I would scour thrift stores to find vessels for the bulbs to grow in, but the one I always used for myself was from my dad. It's a decent size, made of glass, and Dad told me it was an antique battery holder. It's one of the few treasures I have of his, and reminds me just how much he loved shopping for antiques (though, at the time, I thought it was just old junk; what did I know?). 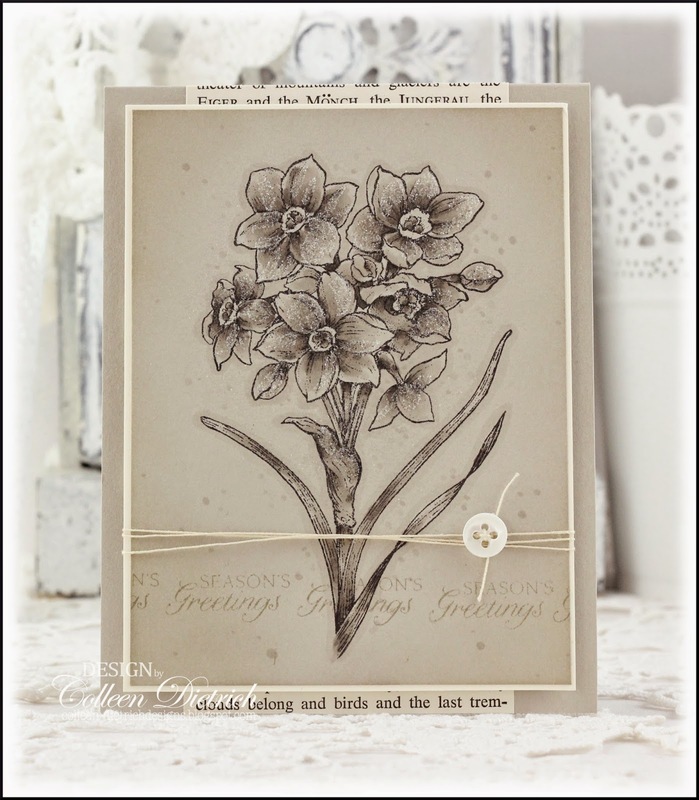 The Christmas cards I'm sharing today feature a Flourishes set, Paperwhites. I was lucky enough to win it one November a few years ago. Each of these two cards have the same color palette: warm grays and cream. Even the same Copic markers were used on each one, but with quite different results. The first is my favorite, and that of my 13 year old daughter, as well. A smidgen of a vintage book page peeks out at top and bottom behind the main panel. A vintage button and thread adorn it. 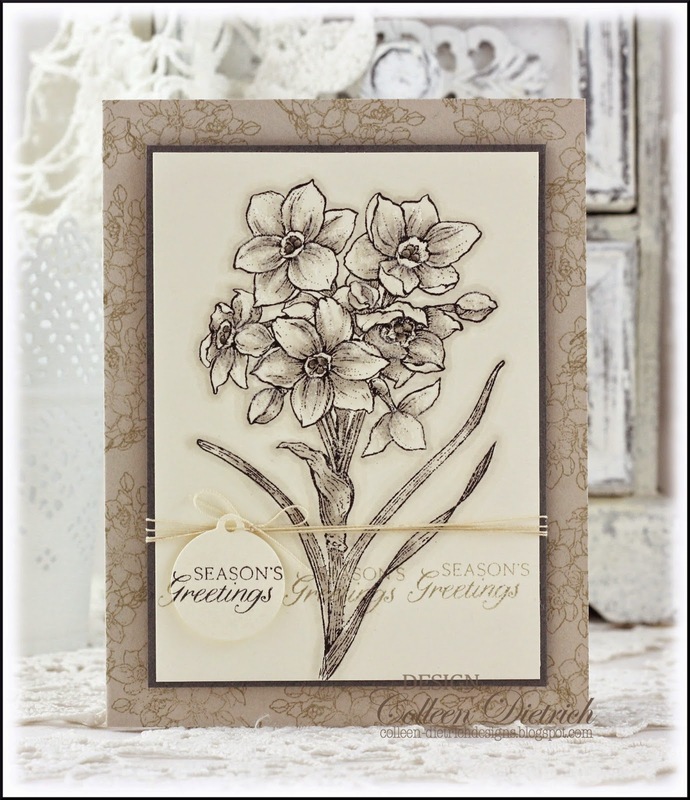 I've stamped the "Season's Greetings" sentiment from the Paperwhites set across the bottom, over the flower stems. Finally, a coating of crystal glitter over the flowers gives it a subtle, festive feel. I used a colorless blender pen by Copic to create some random dots amidst the background. Love how it turned out. 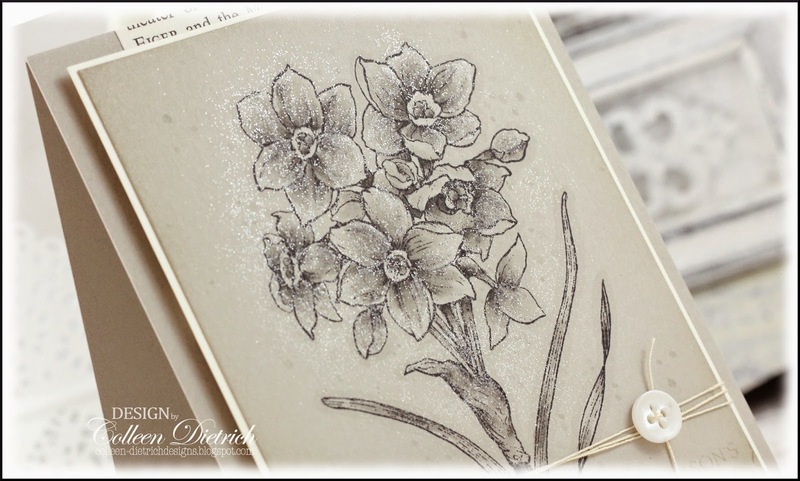 On the next card, I used a smaller bouquet stamp from the set to create a background for the card base. The main panel was colored with the same markers as above, but see how much different it looks when on cream cardstock? 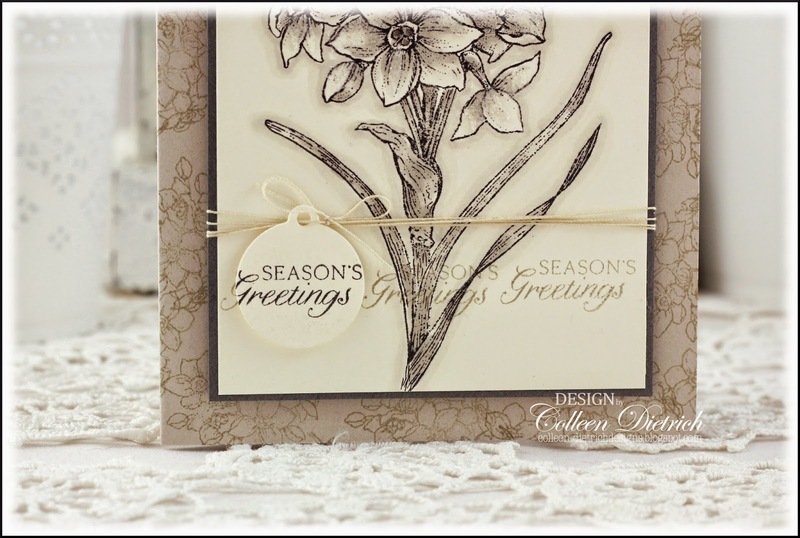 Same greeting, stamped in the same way, but this time I also stamped it in black on a mini circle tag. It was popped up on foam dimensional stickers, and tied with the vintage thread. Before I go, I just want to share a pic of my girls when they were younger. Why? Because this mother's heart is bursting with gratitude to be entrusted with these precious lives. I love my girls so very, very much. Thank you so much for visiting me today. I really appreciate it! These are gorgeous! I love the first one with the added book paper! And loving that photo of your girls!!! ADORABLE!!!!!!!!! What a beautiful card! Beautiful daughters too! Oh wow I love them both Colleen, love this image! But that sweet photo of your girls steals the show today!!! 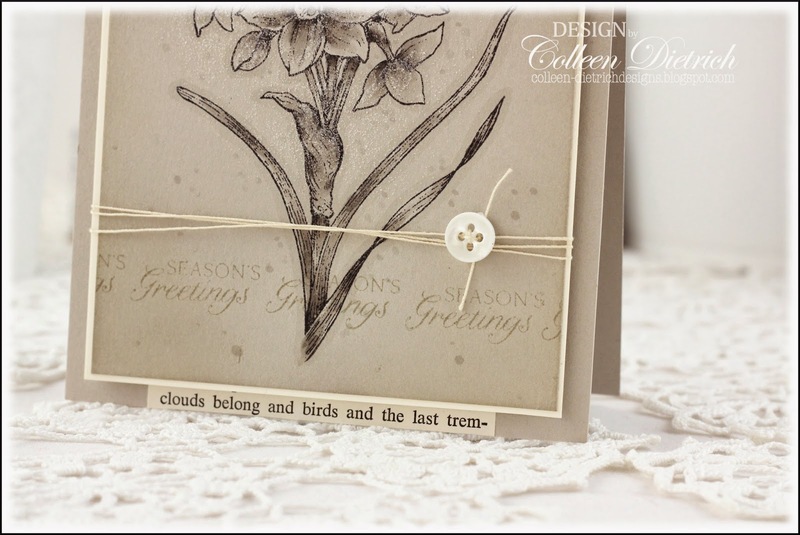 Totally, utterly, fabulously gorgeous cards, Colleen! Wow! And your girls with their sweet smiles -- well, they're some pretty stiff competition for your cards. How darling! Beautiful card Colleen and my choice is the first card. The colors are calm and warm and very pleasant to look at. Our children are our greatest blessings and I too am proud of my sons who are now grown men (how did that happen). Have a wonderful Thanksgiving with your family. P.S. I enjoy all of your creations.